In physics, torque (or often called a moment) can informally be thought of as "rotational force" or "angular force" which causes a change in rotational motion. This force is defined by linear force multiplied by a radius. The symbol for torque is τ, the Greek letter tau. The concept of torque, also called moment or couple, originated with the work of Archimedes on levers. The rotational analogs of force, mass, and acceleration are torque, moment of inertia, and angular acceleration, respectively. In the case of a lever, the torque is equal to the force applied to the lever multiplied by its distance from the lever's fulcrum. For example, a force of three newtons applied two meters from the fulcrum exerts the same torque as one newton applied six meters from the fulcrum. This assumes the force is in a direction at right angles to the straight lever. The direction of the torque can be determined by using the right hand rule: Using your right hand, curl your fingers in the direction of rotation, and stick your thumb out so it is aligned with the axis of rotation. Your thumb points in the direction of the torque vector. As a consequence of either of these definitions, torque is a vector that points along the axis of the rotation it would tend to cause. 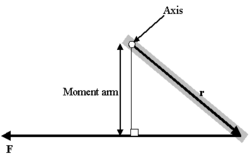 Torque has dimensions of force times distance. The SI unit for torque is the newton meter (N m or N·m). In United States customary units, it is measured in pounds-feet (lb-ft) (or foot-pounds). Although the order of "newton" and "meter" is mathematically interchangeable, the BIPM (Bureau International des Poids et Mesures) specifies that the order should be N·m not m·N. θ is the angle moved, in radians. Other non-SI units of torque include "pound-force-feet" or "foot-pounds-force" or "ounce-force-inches" or "meter-kilograms-force." 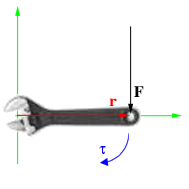 For example, if a person places a force of 10 N on a spanner that is 0.5 m long, the torque will be 5 N·m, assuming that the person pulls the spanner by applying force perpendicular to the spanner. 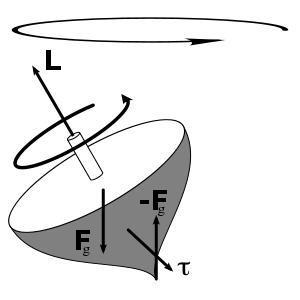 The torque caused by the two opposing forces Fg and -Fg causes a change in the angular momentum L in the direction of that torque. This causes the top to precess. where α is angular acceleration, a quantity usually measured in radians per second squared. Torque is part of the basic specification of an engine: the power output of an engine is expressed as its torque multiplied by its rotational speed. Internal-combustion engines produce useful torque only over a limited range of rotational speeds (typically from around 1,000–6,000 rpm for a small car). The varying torque output over that range can be measured with a dynamometer, and shown as a torque curve. The peak of that torque curve usually occurs somewhat below the overall power peak. The torque peak cannot, by definition, appear at higher rpm than the power peak. Understanding the relationship between torque, power and engine speed is vital in automotive engineering, concerned as it is with transmitting power from the engine through the drive train to the wheels. Typically power is a function of torque and engine speed. The gearing of the drive train must be chosen appropriately to make the most of the motor's torque characteristics. Steam engines and electric motors tend to produce maximum torque close to zero rpm, with the torque diminishing as rotational speed rises (due to increasing friction and other constraints). Therefore, these types of engines usually have quite different types of drivetrains from internal combustion engines. Torque is also the easiest way to explain mechanical advantage in just about every simple machine. On the right hand side, this is a scalar product of two vectors, giving a scalar on the left hand side of the equation. Mathematically, the equation may be rearranged to compute torque for a given power output. However in practice there is no direct way to measure power whereas torque and angular speed can be measured directly. Consistent units must be used. For metric SI units power is watts, torque is newton-meters and angular speed is radians per second (not rpm and not revolutions per second). Also, the unit newton-meter is dimensionally equivalent to the joule, which is the unit of energy. However, in the case of torque, the unit is assigned to a vector, whereas for energy, it is assigned to a scalar. This conversion factor is approximate because the transcendental number π appears in it; a more precise value is 5252.113 122 032 55... It also changes with the definition of the horsepower, of course; for example, using the metric horsepower, it becomes ~5180. For a rotating object, the linear distance covered at the circumference in a radian of rotation is the product of the radius with the angular speed. That is: linear speed = radius x angular speed. By definition, linear distance=linear speed x time = radius x angular speed x time. ↑ Right Hand Rule for Torque, Apache HTTP Server. Retrieved April 10, 2008. ↑ SI brochure Ed. 8, Section 5.1. Bureau International des Poids et Mesures (2006). Retrieved April 1, 2007. ↑ SI brochure Ed. 8, Section 2.2.2. Bureau International des Poids et Mesures (2006). Retrieved April 1, 2007. Tipler, Paul. 2004. Physics for Scientists and Engineers: Mechanics, Oscillations and Waves, Thermodynamics. 5th ed. W. H. Freeman. ISBN 0716708094. "Horsepower and Torque" – An article showing how power, torque, and gearing affect a vehicle's performance. This page was last modified on 11 December 2015, at 23:18.